The project “international exchange of competences of players in protected areas” supports professionals and volunteers of European protected areas in exchanging know-how, experiences, and in building up international cooperation by bringing them together in form of international study trips. The one-week study trips have been undertaken by five groups overall. 32 participants from German protected areas and EUROPARC Germany have been visiting foreign parks and 7 park staff form abroad have been invited to protected areas in Germany. Each study trip focused on one specific main topic. The overall topic treated volunteer management, i.e. the question “how do we involve volunteers in the activities of parks in a professional way?”. The program of the study trips consisted of lectures, workshops and field trips, which gave the participants the opportunity to gain insight into best practice examples of the parks visited and to share their experience and knowledge with experts on site. This way the project created the unique possibility for park staff to learn from each other and to work together on new ideas and strategies. In addition, the study trips enabled the establishment of long-term relationships and cooperation between European parks. At the end of the project the experiences, lessons learned and outcomes will be summarized by the participants in a bilingual publication and discussed in a conference. The project is financed by the German Federal Agency for Nature Conservation (BfN) with funds of the German Federal Ministry for the Environment, Nature Conservation, Building and Nuclear Safety (BMUB). Learning from our neighbours: Eight volunteers and employees of Germany’s National Natural Landscapes and EUROPARC Germany used the opportunity to get to know the educational work of four national parks, De Sallandse Heuvelrug, Weerribben-Wieden, Dwingelderveld and Drents-Friese, during a one-week study trip to the Netherlands at the beginning of October 2017. During this week, the participants were able to experience the high-quality educational offerings in the national parks for themselves. They also got the chance to have intensive discussions with various experts on site and to reflect on the impressions made within their study group. The understanding of Education for Sustainable Development (ESD) in general and also its different interpretation in the Netherlands compared to Germany has thus been increasingly improved. The participants were particularly impressed by the hospitality of the Dutch hosts. Moreover, the projects „Junior Consultancy Agency“ and „Spokesman for Nature“ provided them with concrete ideas for their own work in the National Natural Landscapes. Both projects pursue the goals of encouraging young people to take responsibility for their environment and enabling them to work on their own projects at an early age to further develop their skills. The target group of secondary school students is sensitised to environmental protection issues in economic contexts and is enabled to reflect on the impacts of their own actions. The insights into the organisational structures of the Dutch protected areas’ administration and management were considered as especially interesting as well. In addition to the state administrations, well-established non-governmental organisations such as Natuurmonumenten, are also responsible for the educational work in protected areas. Voluntary commitment is highly important for the protected areas in the Netherlands. Volunteers, for instance, provide services for a wide range of visitor groups in visitor centres. They are professionally guided and coordinated by full-time staff. The personal approach as well as the respect and appreciation the volunteers receive from the full-time staff as well as from the Dutch society as a whole, result in great success of the voluntary work. Additionally, the participants got to know the concept of „parental work“, an interesting approach, which has not yet been consistently implemented in German protected areas, but is explicitly included in almost every Dutch environmental education programme. “Parental work” implies that the children either receive homework assignments, which they have to explain to their parents, or presentations are held for the parents at the end of an educational programme in the respective school. Furthermore, the German group could gather valuable ideas in the areas of youth participation and the anchoring of protected areas in the respective regions. The „Junior Consultancy Agency“, for example, is a school programme for secondary school classes in biology or politics. The school classes act like a regular consulting firm and discuss real-life problems of local businesses. The pupils work responsibly and experience, in some cases even monetary, appreciation from the companies involved. What are successful and innovative financing strategies that can support the basic finances of protected areas? That was the question in focus of the study trip to Finland during the last week of September 2017. 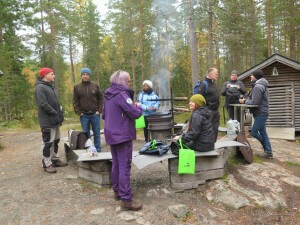 In the course of the study trip six volunteers and employees of Germany’s National Natural Landscapes and EUROPARC Germany visited four Finnish national parks – Nuuksio, Leivonmäki, Southern Konnevesi, and Isojärvi. During their visit the German participants had the opportunity to discuss and share their experiences, concepts, know-how, and ideas with the Finnish park staff and their partner organisations and businesses. The participants viewed the approach as especially inspiring, to provide visitors and locals with positive offerings instead of excluding them with bans and limitations as well as the openness and attentiveness of the personnel towards guests and locals alike. Regarding the main topic of the study trip, the Finnish hosts were able to impress with well managed and allocated EU funding and intensive collaborations with regional partner businesses and organisations. The regional network of partners tremendously supports the financing and implementation of day-to-day activities of the national parks. Private hiking guides, for example, take over tasks in the area of public relations and nature education and cover the resulting costs with their own income. Moreover, the Finnish national parks work together extensively with volunteers, who are deployed in various innovative ways, e.g. in landscape conservation or as voluntary shepherds. Voluntary commitment creates diverse possibilities for nature experience and also increases the awareness and reputation of national parks. A good example therefore is a Friends of the National Park’s group, which offers a driving and companion service for elderly people to “their national park”. This service gives elderly the possibility to visit the national park and experience its beauty, what they couldn’t manage on their own. The study group from Germany also got to know the nationwide national park administration Metsähallitus, which was able to inspire the participants by its forward-thinking approaches to nature conservation. Metsähallitus fosters, for instance, the understanding that nature conservation is a task that needs to be collectively undertaken and financed by society as a whole. This means that in Finland all government departments as well as the general public are involved in financing the national parks. For this reason, everyday needs are linked to nature conservation in order to tap into new financial sources in the areas of sports, tourism, and industry. Especially interesting in this regard were the insights into a new development: the state administration developed alternative valuation approaches for national parks by declaring them as providers for national health care services. This assignment can provide the national parks with new financial resources allocated from the health care sector. On the topic “regional development and tourism in protected areas” an intensive study trip to protected areas in Germany took place from the 14th to 18th of May 2017. Park staff and volunteers from protected areas across Europe were invited to German protected areas as part of the project “International exchange of competences of players in protected areas” organized by EUROPARC Germany. 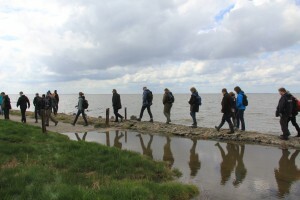 Participants from seven European countries, including the Netherlands, Spain, Portugal, Italy, Slovenia, Hungary and Sweden had the opportunity to get to know best practices regarding regional development and tourism in the Mueritz National Park and Wadden Sea National Park. Just as the previous study trips of German participants visiting protected areas in other European countries, the main aim of this study trip was on discussing and exchanging experiences and know-how with each other and the representatives of the hosting protected areas. The nationwide park’s partner business program of EUROPARC Germany has been regarded as especially interesting by the foreign participants, as similar attempts in other European countries are still in their infancy or even inexistent at all. Hence, the participants were especially excited to meet best practice partnerships between the national parks visited and various local businesses in the national parks and enjoyed inspiring discussions with the canoe rental and a fisherman at Mueritz National Park or with the manager of the information centre of the nature conservation station from the “Schutzstation Wattenmeer” at the Hallig Hooge. 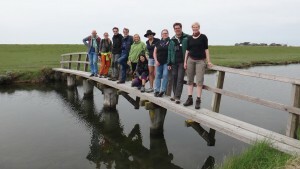 The intensive collaboration between the Wadden Sea National Park and nature conservation organizations such as NABU or Schutzstation Wattenmeer and the involvement of volunteers in the protected area has been regarded as particularly impressive by the participants. Both organizations deliver monitoring and visitor management activities and thus, support the daily work of the Wadden Sea National Park. Another eager discussed topic was the co-existence of tourism and nature conservation. As expressed by participants from the Balaton region, it is difficult to get the local population enthusiastic about the preservation of nature, as they rely heavily on tourism. But, as the example of the Wadden Sea National Park shows, this can be changed by working together closely with local communities. 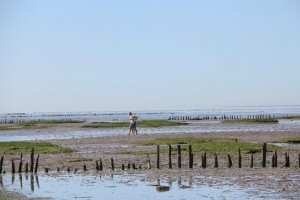 Nowadays, with the full support of the local population, the Wadden Sea National Park demonstrates that pristine nature and biodiversity contribute to the added value and attractiveness of whole regions and, therefore, make a large contribution to regional development and tourism. During the five-day study trip, the participants from European protected areas were able to experience best practices of the two national parks, which differed not only in their landscape diversity, but also in their approaches to tourism and regional development. This wide-ranging experience was a rewarding opportunity and inspiration for guests and hosts alike, who return to their daily work with new ideas and fresh concepts. 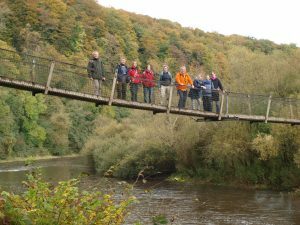 The second study trip in the course of the project “International exchange of competences of players in protected areas”, organized by EUROPARC Germany, took place in the UK from the 16th to 22nd of October 2016. The focus of the study trip was on regional development, tourism and the involvement of volunteers in protected areas. The nine participants – staff from protected areas and EUROPARC Germany – had the opportunity to experience best practice examples referring to the topic in the Brecon Beacons National Park, Wye Valley Area of Outstanding Beauty (AONB), and the Cotswolds AONB. Highlights of the study trip were e.g. visits to large-scale tourism projects such as the “Cotswold Way National trail”, a long distance route that has been awarded the “Walkers are Welcome” status. Discussions with the British park staff clarified the associated challenges of this project such as legal issues concerning property rights. Other interesting inspirations were drawn e.g. from the “Brecon Beacons Ambassador Project”. This project consists of workshops offered to local tourism businesses and instructs the participants on how to inspire visitors and locals about their region. The “Brecon Beacons Ambassador Project” or the “Wye Valley River Festival” were perceived to be best practice examples for regional development, as they focus on a positive interplay between people and nature. In the German participant’s view this approach would give German protected areas the chance to better involve local people in the development of protected areas. More exchange of expertise between the study trip hosts and participants was stimulated by the presented “Cotswolds Choice” initiative, which is an environmental quality brand promoting landscape-friendly local products. The participants were also able to learn from innovative and pioneering approaches to volunteer management in protected areas such as the use of new media or an interactive volunteer calendar to manage volunteer working hours. The study trip was a rewarding opportunity for active exchange between representatives of the host parks and German park staff, who had the possibility to share their know-how and experiences and discuss new ideas and concepts. 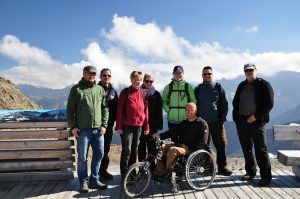 Seven participants of the first study trip to Austria on the topic of “accessibility and inclusion of people with disabilities in protected areas” organised by EUROPARC Germany just arrived happily back home. The study trip was part of the project “international exchange of competences of players in protected areas”. 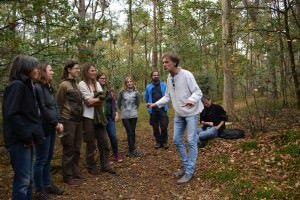 This project gives payed and volunteer park staff the possibility to exchange know-how, experiences and strategies in specific aspects of park management with colleagues in protected areas of other European countries. The German park staff were invited by the Donau-Auen and Gesaeuse National Park as well as by the Purkersdorf and Kaunergrat Nature Park from the 4th to the 10th of September 2016. Besides the insights gained by visiting best practice examples of the mentioned parks, the participant’s and host’s main benefit of the trip was the possibility to discuss successful concepts and measures in the field of accessibility and inclusion of people with disabilities with other professionals and colleagues. Several new ideas and suggestions were given to the German participants, e.g. relating to an off-road tour especially for blind and partially sighted people, to the “Swiss-Tracs” – an off-road towing device for wheelchairs – and to a Rolli Road Book with tour instructions for wheelchair user. In return, the German participants could give detailed advice based on their own Expertise.